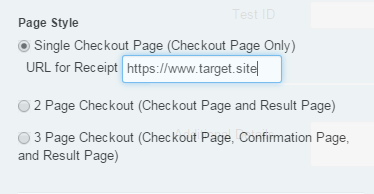 For every Payment Page you have created, you have the option of setting the page style to be single page, 2 page, or 3 page checkout. If you want additional control over transactions being processed through your Payment Page, you can use single page checkout to intercept the results of a processed transaction. Enter the URL desired to send the response data. Click Save and Exit to close the builder. Next to the one you'd like to make live, click Make it Live to apply the changes to the live page.